The energetic and bold Shiba Inu is one of the ancient Asian dog breeds. The Shiba Inu is brave, loving, and independent. They are very charming, and are reserved but non-aggressive with strangers. They develop a strong bond with their handlers and do well with children. Cats and other dogs will be accepted if they are socialized early, but because they have a strong hunting instinct they can not to be trusted with small pets. They travel very well. When selecting a Shiba, look for hip and kneecap problems. Breed Type The Shiba Inu is a non-sporting breed. One of the ancient Asian breeds, the Shiba is fearless and lively. This breed is suitable for virtually any area due to its all-weather coat. Background Researchers have confirmed that the Shiba Inu has existed at least since the third century B.C. Originally bred for hunting, it is now normally a pet. The breed nearly became extinct during World War II. Hybrids include the Imo-Inu (American Eskimo and Shiba Inu mix) and the Shocker (Cocker Spaniel and Shiba Inu mix). Description The Shiba Inu is a fairly small, fluffy dog with pricked ears and small, dark eyes and nose. They are usually red, red and black, or black and tan, but any color is acceptable by breed standards. They are, however, expected to have white or cream markings on the cheeks, muzzle, throat, and underside. The tail is furry and curled. Males are 14-16 inches tall and weigh 18-25 pounds; females are 13-15 inches tall and 15-20 pounds. Care and Feeding The best foods for a Shiba Inu include poultry, lamb, fish and rice. Regular brushing is required to remove dead hair. The Shiba should be bathed only when very dirty, because bathing can damage the coat's natural waterproofing. This breed tends to keep itself clean. Shibas shed heavily at times, so if kept inside, regular vacuuming is necessary. Housing Your Dog Shibas do well both indoors and out, but they need a fenced yard and plenty of contact with humans. Social Behaviors Shibas are independent yet affectionate, and tend to develop strong bonds with handlers. They are great with children. They can get along with other dogs and cats if they are introduced early, but because of their hunting instincts should not be trusted with small pets. Handling and Training Training a Shiba may be difficult. For best results, start at a young age. Housebreaking rarely presents a problem. Activities The Shiba needs, but does not demand, regular exercise. Daily walks are advisable. 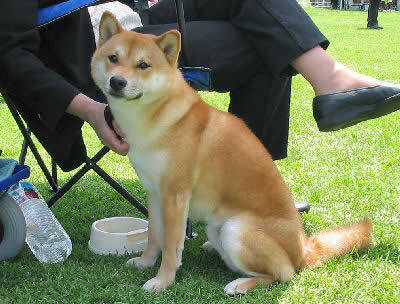 Breeding/Reproduction Shiba Inus rarely have genetic defects. When selecting a mate, check bloodlines for epilepsy, hip dysplasia and patellar luxation. Common Health Problems Some Shibas develop eye problems such as glaucoma and cataracts. Your veterinarian can determine the best course of action should this occur. Availability Shibas are available in most areas, and can also be located online. Prices are usually between $500 and $700.